I’ve been meaning to make a foam puppet to employ as a mascot for this DIY site, and finally got around to it. I watched many videos showing how to make foam puppets, and all of them showed how to make the skin out of fleece. This looked too complicated for a beginner to do, so I hit on the idea to make the skin, facial features and hair by needle-felting wool fibers onto the foam. To practice, I made a dog puppet out of foam with needle-felted skin and it turned out awesome! The needle felting was perfect for my multi-colored dog (and for whatever puppet you want to make) because it allows you to do careful shading and also to build up features like lips, nose, warts, scars, etc, that fleece doesn’t do as well. The dog puppet looked so realistic that I made a movie titled “How Seamus Became a Real Dog.” You can watch it at the end of this post. Next I made “DIY Pixie” as seen above. The pattern for the head may not be the best available, but it worked well enough for this puppet. 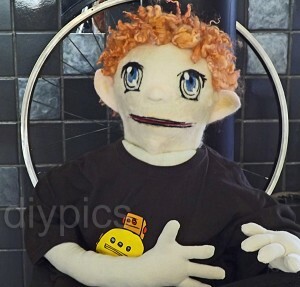 I wanted the puppet to have a pointy chin, big eyes, big ears, and a mop of curly hair. Like me. Sort of. The pattern (I made adjustments even after glueing the pieces together) looked something like the drawing on the right. 1. 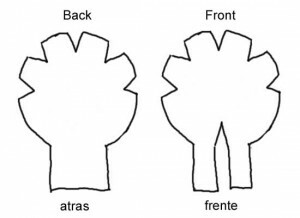 Trace the front and back of the head pattern on a piece of 1/2 inch foam. 2. Cut the foam pattern pieces. 3. Needle felt skin-colored wool roving on the entire front piece and lower part of the back piece (no need to put skin color where the hair will go). 4. Needle felt eyes and nose. 5. Glue the triangle darts together on the front and back pieces of the foam head. 6. Glue the front and back of the head together. 7. Cut two ears out of felt and needle-felt skin colored wool onto the ears. Glue the ears to the head. 8. Needle felt hair onto the foam head. You can also hot-glue faux fur onto the foam for hair. For the body and neck you will need to watch the last part of this video showing the step-by-step process for making this foam puppet. 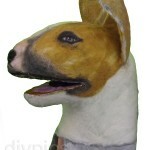 The design is different from most foam puppets, as this puppet head is not glued to the body but floats and swivels inside the body of the puppet. Please ask me any questions you have about making foam puppets in the comments below. I will try to answer every question. Olá! Sou APAIXONADA por bull terriers (já tive 3) e gostaria de saber se você pode me ceder o tutorial de confecção do seu fantoche cachorrinho. Ficou lindo demais! Nunca fiz um fantoche, mas adorei o seu trabalho. Parabéns! Obrigada, Carmen. A confecção do cachorrinho foi feito com agulha de feltragem–do mesmo jeito que fiz o fantoche “menina.” É sómente usar fibra de lã (especial para feltragem) da cor que voce quiser e seguir uma foto de bull terrier como padrão. Oh, Seamus. Good thing you put that last spark out! Foam puppets are fun for sure, but real dogs are funner. Thanks for the laughs and great puppet tutorial!